The name is also rendered as Inupiatun, Iñupiatun, Iñupiaq, Inyupiaq,  Inyupiat,  Inyupeat,  Inyupik,  and Inupik. 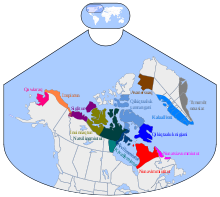 The main varieties of the Iñupiaq language are Northern Alaskan Iñupiaq and Seward Peninsula Iñupiaq. The Iñupiaq language has been in decline since contact with English in the late 19th century. American colonization and the legacy of boarding schools have created a situation today where a small minority of Inupiat speak the Iñupiaq language. There is, however, revitalization work underway today in several communities. The Iñupiaq language is an Inuit-Yupik-Unangan language, also known as Eskimo-Aleut, has been spoken in the northern regions of Alaska for as many as 5,000 years. Between 1,000 and 800 years ago, Inuit peoples migrated east from Alaska to Canada and Greenland, eventually occupying the entire Arctic coast and much of the surrounding inland areas. The Iñupiaq dialects are the most conservative forms of the Inuit language, with less linguistic change than the other Inuit languages. In the mid to late 19th century, Russian, British, and American colonizers would make contact with Inupiat people. In 1885, the American territorial government appointed Rev. Sheldon Jackson as General Agent of Education. Under his administration, Inupiat people (and all Alaska Natives) were educated in English-only environments, forbidding the use of Iñupiaq and other indigenous languages of Alaska. After decades of English-only education, with strict punishment if heard speaking Iñupiaq, after the 1970s, most Inupiat did not pass the Iñupiaq language onto their children, for fear of them being punished for speaking their language. Today, the University of Alaska Fairbanks offers bachelor's degrees in Iñupiaq language and culture, while a preschool/kindergarten-level Iñupiaq immersion school named Nikaitchuat Ilisaġviat teaches grades PreK-1st grade in Kotzebue. Seward Peninsula Iñupiaq is spoken on the Seward Peninsula. Northern Alaskan Iñupiaq is spoken from the Northwest Arctic and North Slope regions of Alaska to the Mackenzie Delta in Northwest Territories, Canada. A word may only begin with a stop (excluding palatal stops), s, y, m, n, or a vowel—with the exception of foreign loan words, proper names, and exclamations. This applies to both the Seward Peninsula dialects (using the Little Diomede Island sub-dialect as a representative example) and the North Slope dialects. The only exception is Uummarmiutun, which can have a word begin with an /h/. For example the word for "ear" in North Slope and Little Diomede Island dialects is "siun" whereas in Uummarmiutun it is "hiun". A word may end in any nasal sound (except for the /ɴ/ found in North Slope), in the stops t, k, q, or in a vowel. In the North Slope dialect if a word ends with an m, and the next word begins with a stop, the m is pronounced /p/. For Example: aġnam tupiŋa is read /aʁnap tupiŋa/ (IPA for vowels may be incorrect). Please note, all ambiguities listed below exist because sources are inconsistent in reporting phonology. The phonological inventory was pieced together using multiple sources. Any discrepancies between the sources are marked as ambiguities. Ambiguities do not represent dialectal differentiation or different allophones. The voiceless stops /p/ /t/ /k/ and /q/ are not aspirated. This may or may not be true for other dialects as well. Two consonants cannot appear together unless they share the manner of articulation (in this case treating the lateral and approximate consonants as fricatives). The only exception to this rule is having a voiced fricative consonant appear with a nasal consonant. Since all stops in North Slope are voiceless, a lot of needed assimilation arises from having to assimilate a voiceless stop to a voiced consonant. * The sound /ɴ/ is not represented in the orthography. Therefore the spelling ġn can be pronounced as /ʁn/ or /ɴn/. In both examples 1 and 2, since voiced fricatives can appear with nasal consonants, both consonant clusters are possible. Since voiced fricatives can appear with nasal consonants, both consonant clusters are possible. Please note that the sound /it̚ʲ/ does not have its own letter, and is simply spelled with a T t. The IPA transcription of the above vowels may be incorrect. Note in the first example, due to the nature of the suffix, the /q/ is dropped. Like the first set of examples, the IPA transcriptions of above vowels may be incorrect. If a strong i precedes geminate consonant, the entire elongated consonant becomes palatalized. For Example: niġḷḷaturuq and tikiññiaqtuq. Like the first two sets of examples, the IPA transcriptions of above vowels may be incorrect. * Ambiguities: This sound might exist in the Uummarmiutun sub dialect. The /f/ is always found as a geminate. The /j/ cannot be geminated, and is always found between vowels or proceeded by /v/. In rare cases it can be found at the beginning of a word. The /h/ is never geminate, and can appear as the first letter of the word, between vowels, or preceded by /k/ /ɬ/ or /q/. The /tʃ/ and /dʒ/ are always geminate or preceded by a /t/. The /ʐ/ can appear between vowels, preceded by consonants /ɣ/ /k/ /q/ /ʁ/ /t/ or /v/, or it can be followed by /ɣ/, /v/, /ʁ/. Unlike the other Iñupiaq dialects, the Seward Peninsula dialect has a mid central vowel e (see the beginning of the phonology section for more information). Iñupiaq was first written when explorers first arrived in Alaska and began recording words in the native languages. They wrote by adapting the letters of their own language to writing the sounds they were recording. Spelling was often inconsistent, since the writers invented it as they wrote. Unfamiliar sounds were often confused with other sounds, so that, for example, 'q' was often not distinguished from 'k' and long consonants or vowels were not distinguished from short ones. In 1946, Roy Ahmaogak, an Iñupiaq Presbyterian minister from Utqiagvik, worked with Eugene Nida, a member of the Summer Institute of Linguistics, to develop the current Iñupiaq alphabet based on the Latin script. Although some changes have been made since its origin—most notably the change from 'ḳ' to 'q'—the essential system was accurate and is still in use. Due the number of dialects and complexity of Iñupiaq Morphosyntax, the following section will be discussing Malimiutun morphosyntax as a representative example. Any examples from other dialects will be marked as such. The subject of an intransitive sentence or the object of a transitive sentence take on the absolutive case. This case is likewise used to mark the basic form of a noun. Therefore all the singular, dual, and plural absolutive forms serve as stems for the other oblique cases. The following chart is verified of both Malimiutun and North Slope Iñupiaq. Kamik (boot) → kammak (two boots). savik (knife) → saviik (two knives). This suffix applies to all singular unpossessed nouns in the ergative case. Please note the underlying /tə/ form in the first example. Marks nouns that are means by which the subject achieves something (see instrumental) Aŋuniaqtim aġviġluaq tuqutkaa nauligamik. [hunter (ergative)] [gray wale (absolutive)] [kill—indicative; third person singular subject and object] [harpoon (using it as a tool to)] The hunter killed the gray whale with a harpoon. Marks the apparent patient (grammatical object upon which the action was carried out) of syntactically intransitive verbs Miñułiqtugut umiamik. [paint—indicative; third person singular object] [boat (having the previous verb being done to it)] We're painting a boat. Tuyuġaat tuyuutimik. [send—indicative; third person plural subject, third person singular object] [letter (new piece of information)] They sent him a letter. Marks the specification of a noun's meaning to incorporate the meaning of another noun (without incorporating both nouns into a single word) (Modalis of specification)  Niġiqaqtuguk tuttumik. [food—have—indicative; first person dual subject] [caribou (specifying that the caribou is food by referring to the previous noun)] We (dual) have (food) caribou for food. Qavsiñik paniqaqpit? [how many (of the following noun)] [daughter—have] How many daughters do you have? Since the ending is the same for both dual and plural, different stems are used. In all the examples the k is assimilated to an ŋ.
Signifies that the statement is for the purpose of the marked noun Niġiqpaŋmun niqłiuqġñiaqtugut. [(for the purpose of) feast ] [prepare.a.meal—future—Indicative; first person plural subject] We will prepare a meal for the feast. Signifies the beneficiary of the statement Piquum uligruat paipiuranun qiḷaŋniqsuq. [Piquk (ergative)] [blanket (absolutive) plural] [(for) baby plural] [knit—indicative; third person singular] Evidently Piquk knits blankets for babies. Marks the noun that is being addressed to Qaliŋaŋmun uqautirut [(to) Qaliŋaŋmun] [tell—indicative; third person plural subject] They (plural) told Qaliŋak. *It is unclear as to whether this example is regular for the dual form or not. Again, Malimiutun Iñupiaq is used as a representative example in this section. The basic structure of the verb is [(verb) + (derivational suffix) + (inflectional suffix) + (enclitic)], although Lanz (2010) argues that this approach is insufficient since it "forces one to analyze ... optional ... suffixes". Every verb has an obligatory inflection for person, number, and mood (all marked by a single suffix), and can have other inflectional suffixes such as tense, aspect, modality, and various suffixes carrying adverbial functions. Tense marking is always optional. The only explicitly marked tense is the future tense. Past and present tense cannot be marked and are always implied. All verbs can be marked through adverbs to show relative time (using words such as "yesterday" or "tomorrow"). If neither of these markings is present, the verb can imply a past, present, or future tense. Present Uqaqsiitigun uqaqtuguk. [telephone] [we dual talk] We (two) talk on the phone. Future Uqaqsiitigun uqaġisiruguk. [telephone] [we dual future talk] We (two) will talk on the phone. Marking aspect is optional in Iñupiaq verbs. Both North Slope and Malimiut Iñupiaq have a perfective versus imperfective distinction in aspect, along with other distinctions such as: frequentative (-ataq; "to repeatedly verb"), habitual (-suu; "to always, habitually verb"), inchoative (-łhiñaaq; "about to verb"), and intentional (-saġuma; "intend to verb"). The aspect suffix can be found after the verb root and before or within the obligatory person-number-mood suffix. Indicative Declarative statements aŋuniaqtit siñiktut. (hunt-nominalized-plural) + (sleep-3rd person; indicative) The hunters are sleeping. Participles Creating Relative Clauses Putu aŋutauruq umiaqaqtuaq. (Putu) + (young-man) + (boat-have-3rd person; participle) Putu is a man who owns a boat. "who owns a boat" is one word, where the meaning of the English "who" is implied through the case. Imperative A command Naalaġiñ! (listen-2nd person-singular; imperative) Listen! Conditionals Conditional and hypothetical statements Kakkama niġiŋaruŋa. (hungry-1st person-singular, conditional, perfective) + (eat-perfective-1st person-singular, indicative) When I got hungry, I ate. Conditional statement. The verb "eat" is in the indicative mood because it is simply a declarative statement. Kaakkumi niġiñiaqtuŋa. (hungry-1st person-singular; conditional; imperfective) + (eat-future-1st person-singular, indicative) If I get hungry, I will eat. Hypothetical statement. The verb "eat" is in the indicative mood because it is simply a statement. Coordinative Formation of dependent clauses that function as modifiers of independent clauses Agliqiłuŋa niġiruŋa. (read- 1st person-singularġ coordinative) + (eat- 1st person-singular, indicative) [While] reading, I eat. The coordinative case on the verb "read" signifies that the verb is happening at the same time as the main clause ("eat" - marked by indicative because it is simply a declarative statement). Indicative mood endings can be transitive or intransitive, as seen in the table below. Iñupiaq grammar also includes morphological passive, antipassive, causative and applicative. Noun incorporation is a common phenomenon in Malimiutun Iñupiaq. The first type of noun incorporation is lexical compounding. Within this subset of noun incorporation, the noun, which represents an instrument, location, or patient in relation to the verb, is attached to the front of the verb stem, creating a new intransitive verb. The second type is manipulation of case. It is argued whether this form of noun incorporation is present as noun incorporation in Iñupiaq, or "semantically transitive noun incorporation"—since with this kind of noun incorporation the verb remains transitive. The noun phrase subjects are incorporated not syntactically into the verb but rather as objects marked by the instrumental case. The third type of incorporation, manipulation of discourse structure, is supported by Mithun (1984) and argued against by Lanz (2010). See Lanz's paper for further discussion. The final type of incorporation is classificatory noun incorporation, whereby a "general [noun] is incorporated into the [verb], while a more specific [noun] narrows the scope". With this type of incorporation, the external noun can take on external modifiers and, like the other incorporations, the verb becomes intransitive. See Nominal Morphology (Instrumental Case, Usage of Instrumental table, row four) on this page for an example. Kaakkama niġiŋaruq. [hungry- third person - reflexive - conditional] [eat- third person - indicative] When he/she got hungry, he/she ate. The verb in the matrix clause (to eat) refers to the same person because the verb in the dependent clause (To get hungry) is reflexive. Therefore a single person got hungry and ate. Kaaŋman niġiŋaruq. [hungry- third person - non reflexive - conditional] [eat - third person - indicative] When he/she got hungry, (someone else) ate. The verb in the matrix clause (to eat) refers to a different singular person because the verb in the dependent clause (To get hungry) is non-reflexive. This is a sample of the Iñupiaq language of the Kivalina variety from Kivalina Reader, published in 1975. Aaŋŋaayiña aniñiqsuq Qikiqtami. Aasii iñuguġuni. Tikiġaġmi Kivaliñiġmiḷu. Tuvaaqatiniguni Aivayuamik. Qulit atautchimik qitunġivḷutik. Itchaksrat iñuuvlutiŋ. Iḷaŋat Qitunġaisa taamna Qiñuġana. Aaŋŋaayiña was born in Shishmaref. He grew up in Point Hope and Kivalina. He marries Aivayuaq. They had eleven children. Six of them are alive. One of the children is Qiñuġana. ^ "Detailed Languages Spoken at Home and Ability to Speak English". www.census.gov. US Census Bureau. Retrieved 2017-11-21. ^ Hammarström, Harald; Forkel, Robert; Haspelmath, Martin, eds. (2017). "Alaskan Inupiaq". Glottolog 3.0. Jena, Germany: Max Planck Institute for the Science of Human History. ^ "Inupiatun, North Alaskan". Ethnologue. ^ a b "Alaska's indigenous languages now official along with English". Reuters. 2016-10-24. Retrieved 2017-02-19. ^ a b "SILEWP 1997-002". Sil.org. Archived from the original on 2012-10-15. Retrieved 2012-08-23. ^ "Inyupeat Language of the Arctic, 1970, Point Hope dialect". Language-archives.org. 2009-10-20. Archived from the original on 2012-03-13. Retrieved 2012-08-23. ^ "Sheldon Jackson in Historical Perspective". www.alaskool.org. Retrieved 2016-08-11. ^ Krauss, Michael E. 1974. Alaska Native language legislation. International Journal of American Linguistics 40(2).150-52. ^ a b c d e f "Iñupiaq/Inupiaq". languagegeek.com. Retrieved 2007-09-28. ^ a b c d e f g h i j k l m n o p q r s t u v w x y z aa ab ac ad ae af ag ah ai aj ak al MacLean, Edna Ahgeak (1986). North Slope Iñupiaq Grammar: First Year. Alaska Native Language Center, College of Liberal Arts; University of Alaska, Fairbanks. ISBN 1-55500-026-6. ^ a b c d e f g h i j k l m n o Dorais, Louis-Jacques (2010). The Language of the Inuit: Syntax, Semantics, and Society in the Arctic. McGill-Queen's University Press. p. 28. ISBN 978-0-7735-3646-3. ^ a b c Lowe, Ronald (1984). Uummarmiut Uqalungiha Mumikhitchiȓutingit: Basic Uummarmiut Eskimo Dictionary. Inuvik, Northwest Territories, Canada: Committee for Original Peoples Entitlement. pp. xix–xxii. ISBN 0-9691597-1-4. ^ a b c Kaplan, Lawrence (1981). Phonological Issues In North Alaska Inupiaq. Alaska Native Language Center, University of Fairbanks. p. 85. ISBN 0-933769-36-9. ^ a b c d e f g h i j k l m n o p q r s t u v w x y z aa ab ac ad ae af Lanz, Linda A. A Grammar of Iñupiaq Morphosyntax. Houston, Texas: Rice University, 2010. ^ Kaplan, Larry (1981). North Slope Iñupiaq Literacy Manual. Alaska Native Language Center, University of Alaska Fairbanks. ^ Kaplan, Lawrence (2000). "L'Inupiaq et les contacts linguistiques en Alaska". In Tersis, Nicole and Michèle Therrien (eds. ), Les langues eskaléoutes: Sibérie, Alaska, Canada, Groënland, pages 91-108. Paris: CNRS Éditions. For an overview of Inupiaq phonology, see pages 92-94. ^ a b c Seiler, Wolf A. (2012). Iñupiatun Eskimo Dictionary (PDF). SIL International. pp. Appendix 7. ISSN 1939-0785. ^ a b "Interactive IñupiaQ Dictionary". Alaskool.org. Retrieved 2012-08-23. ^ "Ugiuvaŋmiuraaqtuaksrat / Future King Island Speakers". Ankn.uaf.edu. 2009-04-17. Retrieved 2012-08-23. ^ Agloinga, Roy (2013). Iġałuiŋmiutullu Qawairaġmiutullu Aglait Nalaunaitkataat. Atuun Publishing Company. Lanz, Linda A. A Grammar of Iñupiaq Morphosyntax. Houston, Texas: Rice University, 2010. There are a number of online resources that can provide a sense of the language and information for second language learners. Qargi.com: an online community focused on supporting modern and triditional Iñupiaq life, language and culture, a Iñupiaq social networking site focused on education and founded under the leadership of the Iñupiaq Education Department, North Slope School District and with the community support of Uncivilized Films (Naninaaq Productions), Community Prophets, Katalyst Web Design, Ilisaunnat, Iñupiaq History, Language and Culture Commission, Ilisagvik College, and the Smithsonian Insititute. https://scholarship.rice.edu/bitstream/handle/1911/62097/3421210.PDF?sequence=1 — Linda A. Lanz's Grammar of Iñupiaq (Malimiutun) Morphosyntax. The majority of grammar introduced on this wikipedia page is cited from this grammar. Lanz's explanations are very detailed and thorough—a great source for gaining a more in-depth understanding of Iñupiaq grammar.